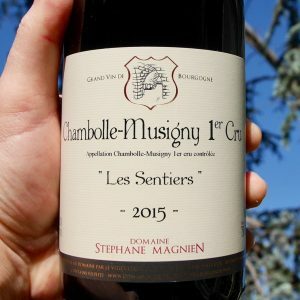 After trying the excellent 2014’s from Magnien I’ve been drooling at the thought of getting my laughing gear around his 2015’s! Finally the wait is over! 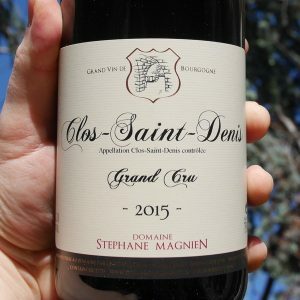 For many years we have been enjoying wines from Domaine Jean Paul and Stéphane Magnien. A small domaine in Morey-Saint-Denis that makes superb, subtle, and old-fashioned wines of terroir from their 4.5 hectares. This tiny Domaine was established in 1897 by Victor Magnien. In 113 years of winemaking, there has only been 4 winemakers! Victor’s son Felix, then Felix ‘s son Jean-Paul and Jean-Paul’s son, Stephane, who is now in charge. The Domaine is proud to say that for four generations they have not used herbicides, using plowing by horse and tractor to preserve the microbial life of the soil and force the vine’s roots to descend more deeply, pulling great typicity from the terroir. 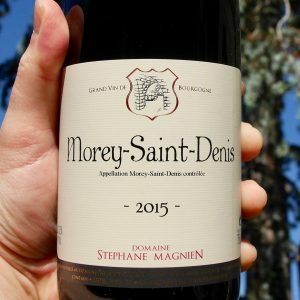 Magnien’s wines have a great purity, poise, and, sophistication about them. Always vibrant and beautifully textured, wait 5 years and you’ll be in a very happy place! 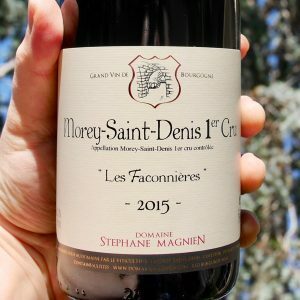 So many Pinot’s from Burgundy leave you wondering what all the hype is about. This is what it’s about! “Far from ‘vins médiatique’ you will find a subtle wine, well-structured, respecting the terroir and the vintage, with great length on the palate… all in finesse. 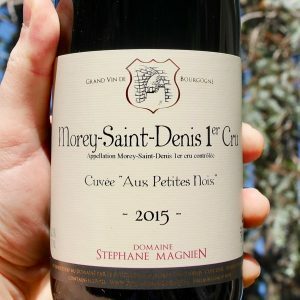 There is a high percentage of old vines in their parcels, including a great deal of “Pinot Tordu,” a small-berried, aromatic old clone of Pinot. Minimal new oak is used, about 15% for the premier and grand cru wines, and the wines are bottled without fining or filtration. Hand harvesting, of course, and long wild-yeast fermentation . The Domaine has a wonderful selection of vineyard in Morey St Denis and Chambolle Musigny, right in the heart of the Cote de Nuit. They range from perfectly situated Village parcels to 1er Cru and Grand Cru. The wines of Morey combine the softness and finesse of a Chambolle Musigny with the structure of Gevrey-Chambertin, they have a little more grunt and sauvage character. 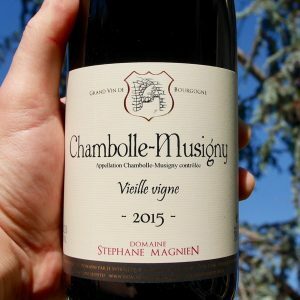 The wines of Chambolle Musigny are renowned for producing beautifully fragrant and perfumed wines with incredible finesse and length of palate. 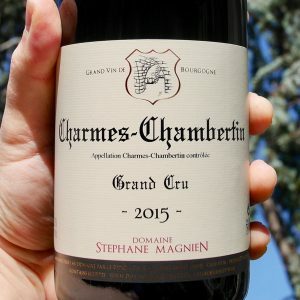 UPDATE December 2017: The Charmes-Chambertin tasted in the video has started to settle and my initial concerns around ripeness are well and truly a distant memory! Unfortunately, it’s all sold out! 4 parcels ‘Les Craigillons’, ‘Les Cognes’, Les Clos-Saulon’, Les Bas-Chenveries’. Red Fruits dominate, juicy and powerful it combines finesse and structure. Drink young or age up to 10 years for further complexity. The 2015 is particularly beautiful, showing a bit more depth and ripeness than the excellent 2014. The palate is dense, but not over-ripe, with a core of firm acidity and mineral flavours. Fresh vibrant red fruits and rhubarb hit you at first wiff. The crunchy round fruit of Morey greet you on the palate. The clarity, not, of appearance, which is brilliant, but expression of the village is all there. Tannins have an edge of welcome grip, that is at the level were it will soften a little with age to render the wine more complete. Delicious. Made from a single parcel ‘les Athlets’ planted by Victor Magnien before the appellation system was even in place! The 2015 wine shows a lovely deep color and ripe complex aromas of strawberry and black cherry, very floral, delicate and fine. The palate is elegant with blackberry and strawberry, citrus and spice, well-balanced by bright acidity. The finish is very long, palate-coating and pure, and lifted by firm acidity and mineral flavors. This is a gorgeous and well-structured Chambolle showing the lush fruit of 2015 in the best possible way. Classic Chambolle, fine. Perfumed, long and incredibly fine. Shifting from Morey Village sees an impressive step up in refinement. One expected when comparing the two villages, one to be appreciated. The long elegant tannins of Chambolle work beautifully adding a degree of precision. Vibrant, perfumed, beautifully balanced and just, delightful. Les Faconnières lies just below the Grand Cru vineyards in Morey-Saint-Denis. As a matter of fact, you can draw an equilateral triangle whose three points would be in Clos-Saint-Denis, Clos de la Roche, and Les Faconnières. The soil is poor and the old vines yield an exceptionnally aromatic wine. Only 2 other producers make wine from this parcel. The wine is already showing its potential, but after another 5 years of cellar time, we anticipate it will be entering its optimal drinking plateau and staying there for many years. Its aromas express dark red berries, herbs, a healthy dose of earthy mineral and tar. The palate is sturdy, yet balanced. The fruit is part of the package, which at this time is tightly coiled, needing either aeration or a few more years of cellaring, but there’s no question that the fruit is just waiting for the structure to back off one small step for it to shine. The mouth feel is medium bodied with fine tannins, and the finish is balanced and all in line. Hold for 5 to 6 years minimum, said Stéphane, best at 7 to 15 years. Extremely rare, the Premier Cru Monts Luisants vineyard is at the top of the slope above Clos de la Roche. This vineyard was called “Monts Luisants” or “glowing hill” because in the autumn, the leaves here turn yellow rather than red. this plot with quite poor soil gives us a typical wine, fine and structured.red wine from Monts Luisants. A blend of two 1er cru plots ‘Les Gruenchers’ and ‘Clos Baulet’. Fine and complex, it has ample structure and concentration, these two parcels have higher clay content and make more structured wines. A slightly fuller wine than Faconnieres. As with all of Stephane’s parcels, there is a high percentage of old vines of “pinot tordu.” With very deep ripe red and black fruits, with herbal and mineral flavors and terrific length. This will need time in the cellar but should be a superb mature wine. Situated below the Chambolle Musigny Grand Cru vineyard of Bonnes Mares. This is a highly sought after parcel and is held within the highest regard in burgundy. The 2015 vintage is effusively perfumed, with aromas of black cherry, wild raspberry, violets, forest floor, and iron. The mid-weight palate is ripe and supple with dark fruits, game notes, and a pungent minerality, girded by firm, ripe tannins and great freshness on a long, complex, rising finish. This is really lovely and will reward 5-10 years cellaring. A beautiful expression of Sentiers! A classic Chambolle, perfumed, lovely flowers, a great core of fruit, brooding, and, of considerable intensity. The themes of clarity, purity, harmony, and, particularly the poise of Chambolle are all right here. The step up in the quality of tannin alone, from the village, justifies the change in status to 1er Cru. The layers of fine long tannin are equally matched by the complexity of the fruit. Tightly coiled now this is going to be a stunner as it passes it the later phases of maturity. 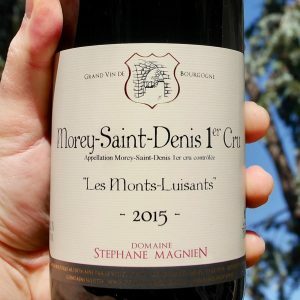 Morey St Denis has only 5 Grand Cru vineyards and it is this parcel that typifies the wine of Morey, fine, brooding, perfumed and powerful, but retaining it’s elegance. Can age up to 20+ years. Situated in the village of Gevrey Chambertin, there is more limestone in the sub soil and the wine is more robust and structured, can live a very long time. The extra oomph of Gevrey-Chambertin is their in terms of both fruit and broader, beefy tannins. This Charmes has an oppulence of fruit at the moment. It's one to watch and see the development of over the next year. There is certainly great depth and length of both. I touch more acid would have been welcome. The quality of the vineyard is evident, I just need to see it pass it's first year of puberty to make sure it's bang on!